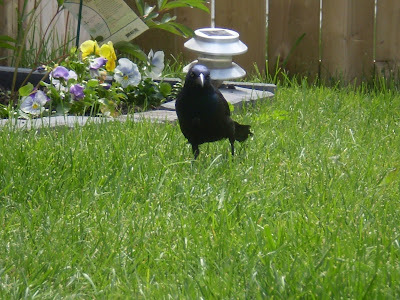 The Beak: Aha, It's a Grackle! HA! I have been trying to get a picture of this guy all weekend, he's become attached to our yard and has visited a few times. 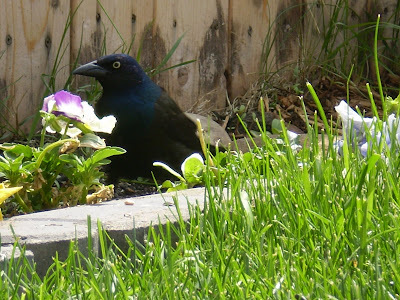 I first thought he was a brewer's blackbird, but then on further research with better pics, I found out he's just a common grackle. Poor guy, so common, so plebian. BUT he eats all the food that the kids leave out LOL he had a feast of goldfish off the grass this morning I guess! So he is more than welcome to keep dropping by and cleaning my yard for me. He also eats all the seeds off the ground, which helps me as well. Here's hoping tho that it stays to just one.....they are flock birds and considered agriculture pests! He is soo gorgeous with that shiny green-blue head, and isn't loud like magpies, so we'll keep him. Omg, he's massive! I'd be freaked! lol..but I'm not a huge bird person. He's gorgeous! What a proud looking bird! Grackle. That word is just awesome.